It's been a week since my last post, and what a week! Other than my final thesis work (it's going quite nice, thanks to you all of you who asked), this past weekend I also had to supervise some minor changes in my soon-to-be new flat in Athens (it involved three builders, dust all over the place and me waking up at 8 in the morning) and then drive all the way back to Volos and dive back into AutoCAD drawing and Photoshop editing. But today, I finally managed to get properly dressed and go outside to get some much-needed supplies, and I thought: "This must be documented! Who knows when I will be able to go out of the house again!" Thanks for sticking around! Less than one month left! Purple dress, BERSHKA. Grey cardigan, BERSHKA. Off-white pashmina, some bazaar in Turkey. Brown studded belt, MANGO. Brown boots, INCI (same as the black ones that I still haven't managed to get repaired). Brown cotton tights, CALZEDONIA. Dark green coat, ATTRATTIVO. Gray tote bag, MANGO. Still there, still lovely. Glad to hear things are rolling along, beautiful! Lovely outfit - I love that pop of purple. hi lopi. glad you're back. :) looking good as always. i am excited to see the new flat. A-d-o-r-a-b-l-e! That purple dress is wonderful. You make everyting look classy and stylish! Are you moving in Athens permanently? We should definately meet! hey! you may be under a lot of pressure but for an architecture supervising her own flat, life must be exciting!! good luck with the thesis, and the new house! so, you gonna be a resident of the capital quite soon? Very nice outfit! =) It's casual yet a little dressy and chic. 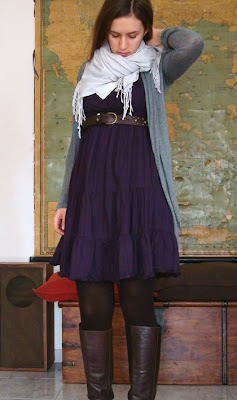 I really like those boots and the way they go with the slightly flouncy dress. All the best with your thesis! You look beautiful, I love your dress and those gorgeous boots. FAB fab fab boots - just my type. And love the way it looks with purple, hmmmm I should try that! Wow! That Lifo thing is so cool! Thanks for telling me! 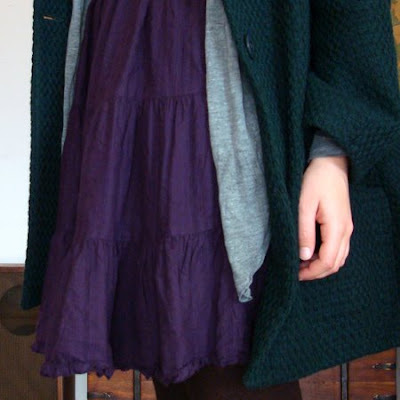 Such a lovely winter look, such great jewel tones. Oso gia to sunolo,gia mia akoma fora apsogo!Latrevw to sunduasmo prasino-mov,an k liges to tolmun..K to palto m ti fousta einai sto idaniko mikos gia na tairiazun metaxu tus! I LOVE this outfit. The colours, the layers, the boots!